The valley is drying after a delicious Sunday of fog and rain. The sun broke through clear and present, ready to take up its position as master scorcher of all things living on earth. Life at eight thousand feet above sea level is intense, the solar exposure being no exception. 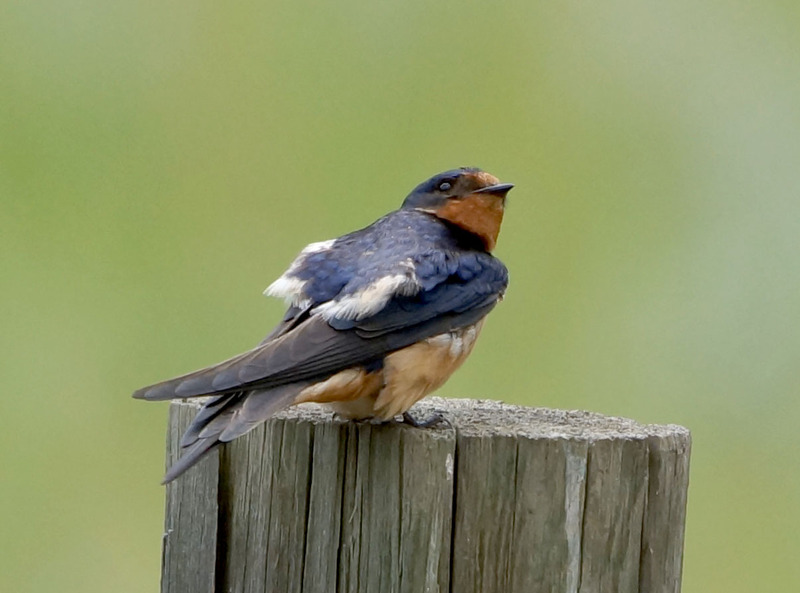 All five of our fledgling Barn Swallows are practicing flights across the pasture this morning, soaring over several acres at a time of meadow grasses edged by a swollen summer creek, returning to rest in the company of siblings along the safety of the old wooden rail fence. It’s been there twenty-five years since I built it to enclose a herd of horses, goats, llamas, sheep and our longhorn heifer, all of whom have passed on after living graceful and peaceful lives in our mountain valley. Today, the pasture is free of livestock and onerous fencing, giving new place and freedom to flocks of migratory birds and wandering elk. Mama and daddy Barn Swallow fly closely alongside the fledglings, at times giving support and guidance from just underneath, twirling midair and up, swooping down and soaring back skyward again. I imagine they’re encouraging them in the only avian way they can, silently and yet fully expressive in their intentions. The families of six to seven fly as though riding an invisible roller coaster only they can see, snatching mosquitoes on the wing. These five – The Wolfram Five – for the valley we live in is named Wolfram, another name for the mineral Tungsten, our old town site – are strong and healthy, hatched in June and ready for virgin flights mid-July. I’m relieved they all made it. I’m also surprised to see five and not the usual four. Mama has been consumed with the task of all things nutritional, tending to their needs every 7-10 minutes. 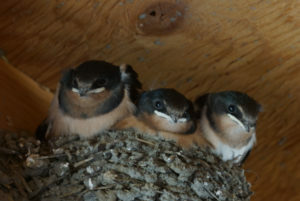 We watched them in their mud nests under the barn rafters, going from egg-to-hatchling-to-nestling-to-fledgling. This morning, their black and russet bodies closely resemble their parents. I know it won’t be long before they leave to take up residence in a pasture or meadow close to here, or maybe they’ll start a nest of their own.